If winter had arrived in November, as it often has in the past,we’d have been unprepared,crops left un-harvested and poorly protected and the detritus of our not-so-neat outdoor existence,ready to be lost under the snow. But nature was kind this year,bestowing a deliciously pleasant November with short,golden days of low-slung sunlight,brightening the browns and greys of the normally dismal and dripping stick-season. So we indulged in puttering,finishing the season’s tasks without urgency. Now with the darkest days at hand and the arrival of sub-freezing temperatures,winter is welcome to bring it’s cleansing cold and insulating blanket of snow. Clear skies earlier this week brought temperatures close to zero degrees F. In the hoop house the kale,mache,lettuce,parsley and other hardy greens,draped with insulating fabric row covers,kept at a reasonable 27 degrees –a temperature that those hardy plants should be able to handle without stress. The newly re-built root cellar is holding steady at about 40 degrees –a little too warm for good storage –but is likely to drop into the optimal mid-30s as the winter cold settles in. Learning from the collapse of our hoop house in the great March snowstorm of 2011,we redesigned the structure this fall,giving it a higher,more sharply-angled profile with better bracing. The hope is that it will now shed snow more effectively so the weight of another unexpectedly heavy snow fall won’t be a problem. Inside the hoop house before the row covers went on,the new sitting area at the far end. 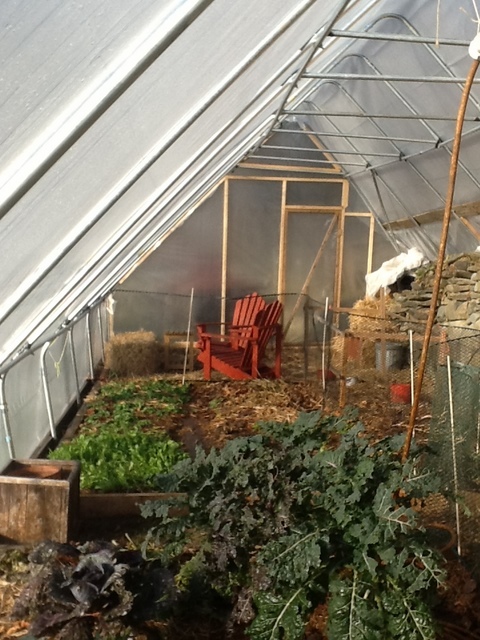 We also indulged ourselves by extending the length of the hoop house another 4-5 feet to make a little sitting space on the far end. Now on sunny winter days we have a comfortable place to rest and for winter picnics. Just seeing the Adirondack chairs there,makes me feel happy. As I’ve noted before,the mental health benefits of having a hoop house in a climate of long winters,is probably it’s greatest asset. In the main garden,a light coating of snow covers the bed where a 6-12″layer of straw is kept dry with a tarp. This insulates carrots stored in the ground right where they grew,preventing the ground from freezing. Because it requires so little work,this in-ground method for storing carrots is my favorite,but it should be avoided in years when rodent populations are exceptionally high. 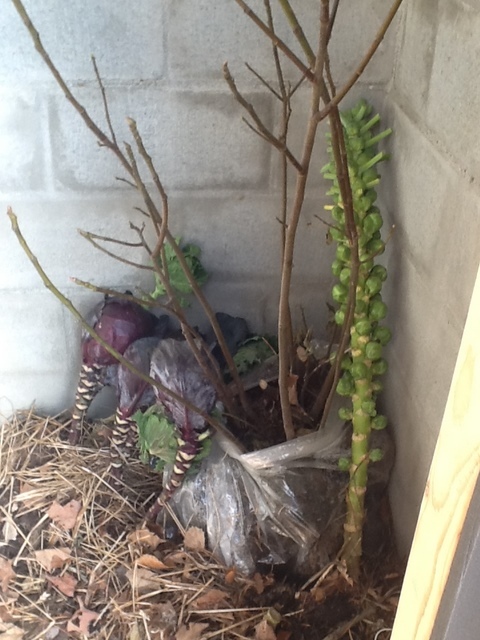 Cabbages,Brussels sprouts and a fig tree in the root cellar. Root cellar crops also offer the same satisfying crack of freshness when storage conditions are optimal. 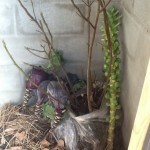 Cabbage plants can be pulled up by the roots and placed on the dirt floor of the root cellar. With a little mulch over the roots and an occasional bucket of water sloshed around to keep the roots moist,these vegetables will keep for months in excellent condition. Even if the outer layer of leaves blacken,the inner leaves remain crisp and delicious. Root crops are packed in buckets and plastic containers,layered with wet wood chips. I like wood chips better than other recommended media like sand or peat moss because the wood chips are readily available,light weight,and keep the roots moist (to maintain freshness) but aerated (to prevent rot). 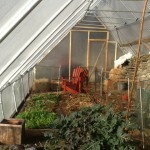 Our root cellar is built into a slope and integrated into the retaining wall on the north side of our hoop house. This enables easy,snow-free access in the winter. The original interior walls of the root cellar were built with hemlock boards but after about ten years the wood rotted and it finally fell apart. Eric rebuilt the cellar this summer with concrete block walls and a new,better insulated door that prevents heat from penetrating the necessary chill of the root cellar when the hoop house heats up on a sunny day. So far,all these new winter systems are performing well. Here’s to continued learning and improving! Best wishes for home-grown success to you and yours in 2012. I have been interested in your approach since I first read the newspaper article about you,and now have spent days doing Internet searches trying to find the article again. Can you tell me more about this? We are (yet again,but really this time!) going to build a root cellar this summer. A greenhouse is also in our future plans,so I am wondering if we can locate and design the root cellar in such a way that they can benefit each other,or at least provide easier winter access to the root cellar? We are in Maine. We have gone to great lengths to avoid using concrete in building our house,and have been looking at wood (perhaps covered with pond liner) for a root cellar. What is your cellar made of? Thanks in advance for any comments you have time for. Glad you’re thinking about doing a root cellar. Such a great,simple way to preserve vegetables! That said,it can be tricky to build one that keeps optimal temperatures and humidity and is easy to access. The advantages of our system of having a small root cellar accessed from our hoop house is that all our winter food is in one location. I also like the fact that we have a frost free hydrant available for washing the veggies and for tossing buckets of water occasionally in the root cellar to maintain the humidity. The down side is keeping sufficiently cold temperatures in the root cellar,especially in fall and spring. 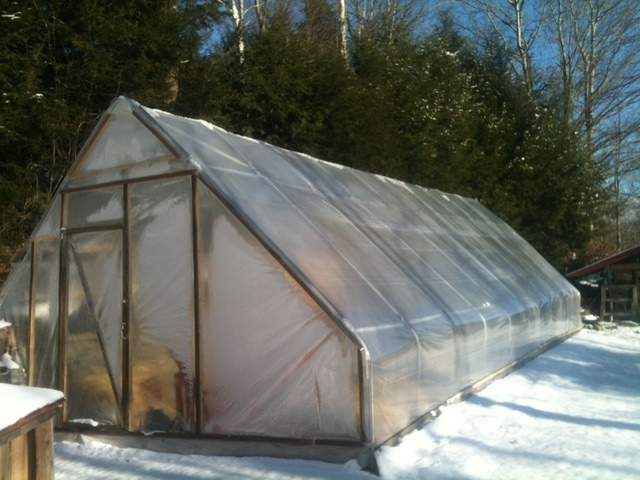 The hoop house just gets too warm during the shoulder seasons so it’s hard to get the root cellar temps into the 30′s. In retrospect,I wish we’d built the root cellar into a slope with access from the wood shed. The shade from the woodshed roof would not only make it easier to get the temps down for winter storage,but I’m guessing that with snow shoveled in at the end of winter,it could be used as a refrigerator in the summer. Our rebuilt root cellar is built with concrete block walls and the roof is hemlock board with a sheet of rigid insulation plus about 6″of soil. A 2″diameter plastic pipe in the ceiling provides ventilation. We plug the pipe when temps get into the sub-zero range to prevent the cellar from freezing. Our previous cellar structure (hemlock board walls) lasted a surprisingly long time –almost 10 years,but wood and moisture don’t belong together so I don’t recommend it. I think a stone wall would be the best building material,especially if you don’t want to use concrete. Hope that helps. If you were looking for the Burlington Free Press article about our property,you can access it from here:http://z4z.thirdculture.com/2012/06/24/addendum/.